Since my second backpacking trip through Europe, I wanted to journey to Southeast Asia. I chose to visit Thailand, Vietnam, Cambodia and Laos, and developed a loose itinerary, starting in Bangkok, Thailand. Bangkok was everything I expected. The number of people everywhere was staggering, but before long I got used to the crowds, the heat and the food. I visited many temples and shops, including the Grand Palace and the famed Khao San Road. The Grand Palace was amazing. Inside there were countless statues of Buddha. To my disappointment, Khao San was the typical tourist trap, with vendors selling T-shirts and bootlegged CDs. After a few days I headed to Phuket, where I played beach bum for a few more days before flying to Saigon, Vietnam. Now, that was exactly what I pictured an Asian city to be - scooters everywhere! Crossing the street in Bangkok was like crossing a street in Des Moines compared to trying to cross the street in a Vietnamese city. The first time in Saigon was a big leap of faith. The trick is to just walk and keep your head turned to oncoming traffic. I spent three weeks in Vietnam traveling from south to north. 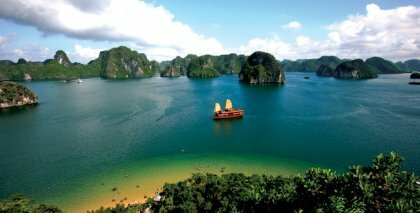 The highlights were eating the food in Hoi An, enjoying Hanoi’s famed Bia Hoi beer gardens and eating snake, and seeing the rock karsts of Halong Bay. I had many choices of border crossings into Laos from Vietnam but I chose the crossing near Vinh in central Vietnam. This meant that I had an eight-hour bus ride from Hanoi to Vinh followed by a 14-hour bus ride to Phonsavan, Laos. Phonsavan is famous for its “Plain of Jars” fields. These are fields of stone jars, each about 4 feet tall and 2 feet wide, scattered everywhere. Other jars are scattered in jungles surrounding Phonsavan. After a day in Phonsavan I headed to Luang Prabang for a few days and then to Vang Vieng. My time in Vang Vieng was some of the best. There I went on a two-day trek that included hiking over mountains, spelunking through caves and kayaking the Nam Song River that runs through the town. The town has become a hotbed for young tourists who tube down the river. The river has a number of bars along its banks. Some have zip lines, bungee jumps and slides for the patrons to enjoy and all blare techno music. Cambodia was the biggest surprise of the trip because I knew the least about it. The biggest draw to Cambodia is Siem Reap where Angkor Wat is located. Many people go only to see Angkor Wat but there are many more temples around Siem Reap and Cambodia. I felt like I was on another planet when I went to Angkor Wat to watch the sun rise over the temple. I spent two months in Southeast Asia and there are still parts I didn’t see. I enjoyed every minute. Many people ask if I felt safe. I did.